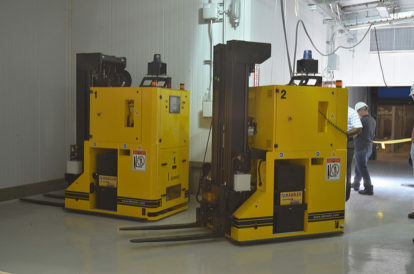 During operations, Automated Guided Vehicles, or AGVs, will carry mustard-filled munitions between the Enhanced Reconfiguration and Agent Processing Buildings at the Pueblo plant. The Pueblo Chemical Agent-Destruction Pilot Plant, or PCAPP, will safely and efficiently destroy a stockpile of chemical munitions securely stored at the U.S. Army Pueblo Chemical Depot. The munitions will begin their journey through the destruction process in the Enhanced Reconfiguration Building (ERB), where robots will remove their energetics and miscellaneous parts. The palletized rounds, still containing mustard agent, will be transported down a 450-foot-long corridor to the Agent Processing Building. Transport will be accomplished up to 11 times per hour via three automatic counterbalanced fork trucks called Automated Guided Vehicles, or AGVs. They are part of the AGV System, which is a self-contained system designed to integrate with plant equipment and the facility control system. The three AGVs serving the plant are based on current technology used throughout the warehousing industry. The selected vehicle, a Dematic HK-35, has a maximum capacity of 3,500 pounds and can handle expected loads of up to 2,150 pounds with ease. Powered by a single 48-volt rechargeable battery, the 5.6-ton AGV has a drive unit in front, two fixed rear wheels, and a self-contained hydraulic system to power the lift function. An onboard microprocessor will execute commands for automatic transport and delivery as well as all safety devices and communications. When necessary, the AGV can be operated manually. When maneuvering throughout the facility, the AGV uses a rotating laser scanner to continuously “look” for pre-determined stationary targets along its route. Once a target is acquired, angle and distance data are combined with speed, allowing the AGV’s microprocessor to constantly compute and determine its own relative position as it moves along. Additional laser scanners on the front and rear of the AGV act as “bumpers” to protect the vehicle from accidentally coming in contact with other obstacles. When a foreign object is encountered the AGV will stop, locking its drive and steering functions, flashing its lights and sounding a series of fast beeps. Once the path is clear, the unit will resume operation after a three-second delay. It is recognized that a limited number of munitions will not be able to be easily processed through the main destruction plant. These problematic munitions include those that have leaked in the past and are overpacked, as well as “rejects” whose condition does not allow for automated processing. These munitions will be safely processed in the PCAPP’s Explosive Destruction System.